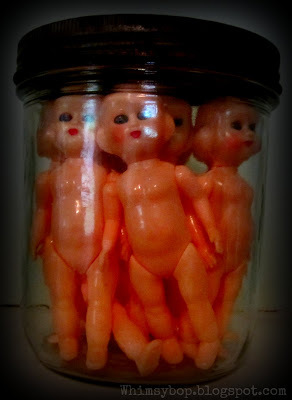 It is so sad to see April come to an end and equally sad to end our Collections in a Jar series. My Grand Finale is a random look at a few of my favorite collections in a jar that make me smile. This first collection in a jar proves that I am a shameless pack-rat while also proving that you can make a collection out of just about anything (obviously)! I started saving birthday candles after celebrating my daughter's first birthday when I didn't have the heart to throw her candle away. Since then, I've saved each and every candle that has ever been blown out on a birthday cake by a member of our family! 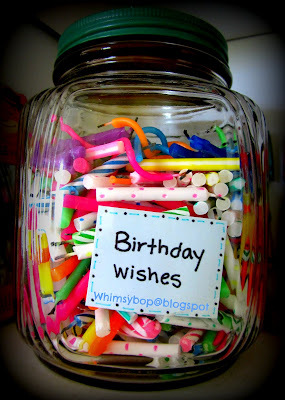 It's one of my dearest and sweetest collections in a jar. I have a fond attraction for old buttons and sewing notions, and I can't tell you how much I enjoy looking at the beautiful colors and shapes through an old glass jar. I often find these old notions at estate sales, yard sales and flea markets sometimes in the same sewing basket or little box where the last seamstress left them years before. I keep them in a wardrobe that houses my arts & crafts supplies as well as my collection of sewing books; hopeful that the more sewing notions and books I accumulate, the better my chances of becoming a great seamstress one day (for now I'm lucky if I can sew a pair of curtains). My daughter has taken over as Queen button collector in the family. She has been fascinated with them since she was a little girl playing in my Mom's button collection, sifting them through her little fingers like sand. Showing collections off in a jar adds an eclectic touch in decorating and works especially well when grouped together. 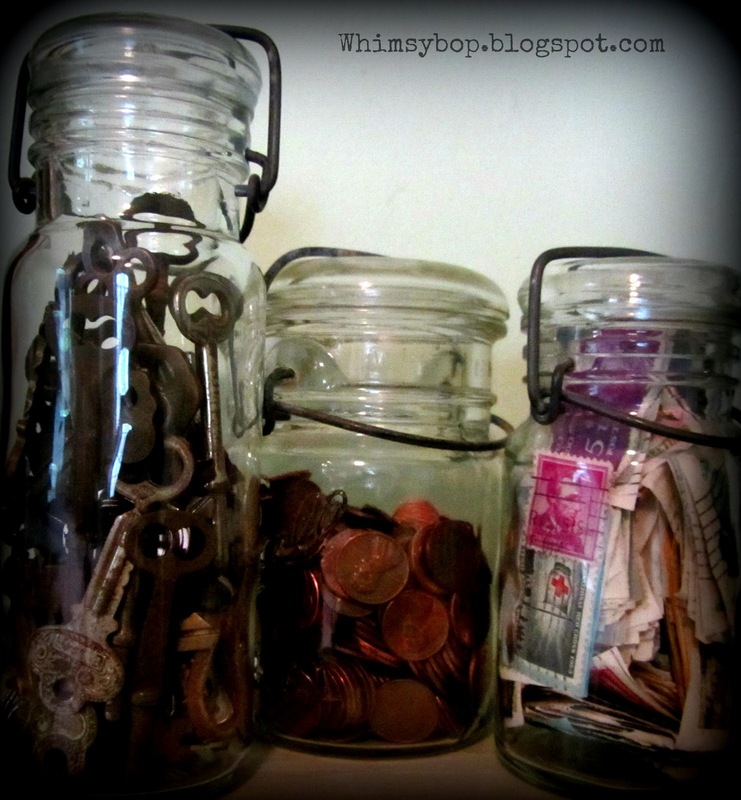 These old jars in my guest room contain various collections of old stamps, skeleton keys and pennies. I can't tell you why, but for several years now I've had this unexplainable urge to save every penny from my birth year and keep them in a jar (just call me RainMan). 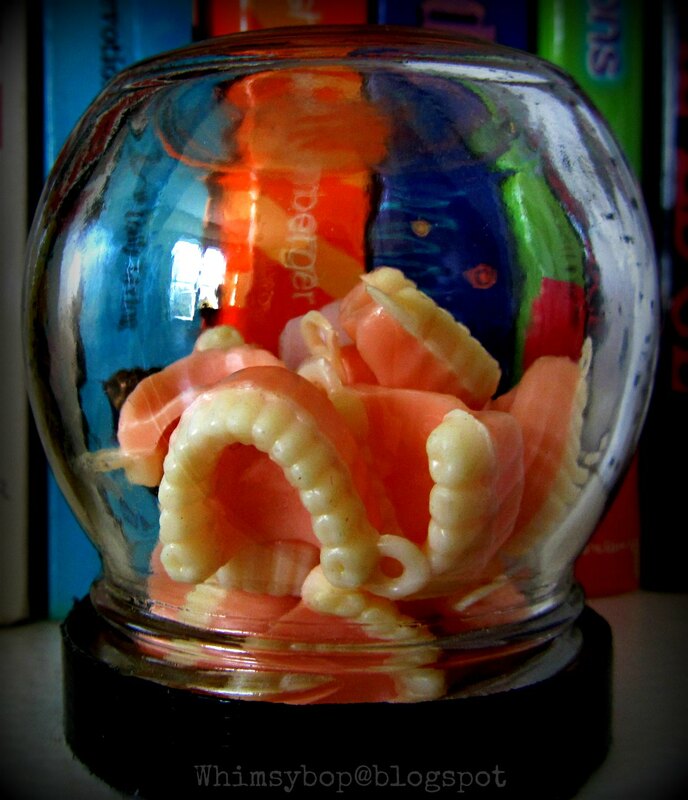 My daughter presented me with this instant collection of miniature dentures on my last birthday. She told me that the moment she saw the quirky little things she knew that I would LOVE them (and I do!). They are goofy little key chains and they CRACK ME UP! I need to put them near my bathroom sink to remind me to floss everyday but, for now, they sit on my art table and make me smile. Speaking of smiling - this jar of little plastic dolls has no special significance except they seem to creep everyone out, especially my daughter, which I find very amusing. Well that's it! 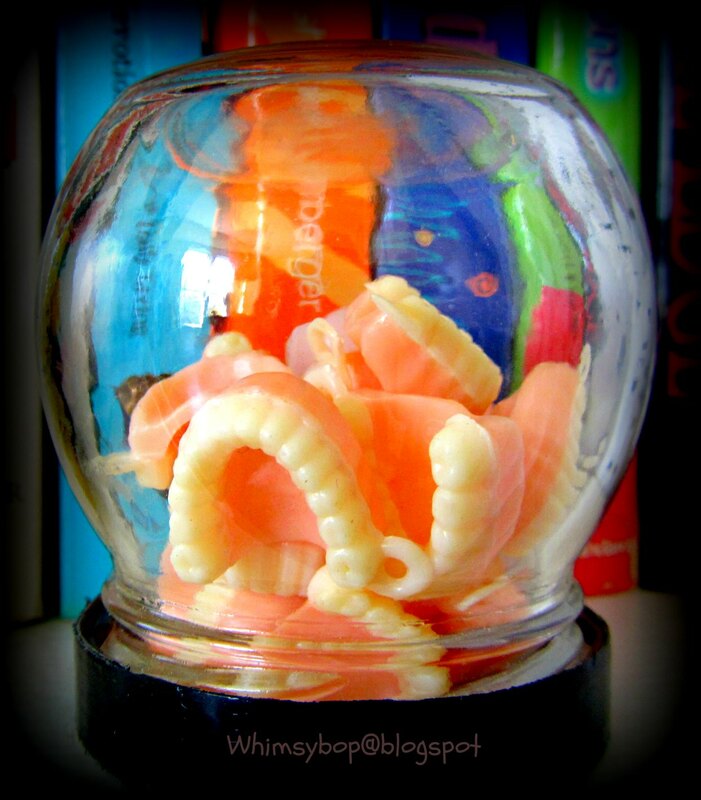 I hope you enjoyed Collections in a Jar throughout this month at Whimsybop. Stay tuned next week when we focus on Collections in a ziplock bag (just kidding! ).